PWM Constant-Current Stepping Motor Driver (PT2463) - Princeton Technology Corp. 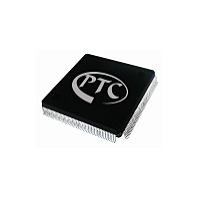 The PT2463 is a motor driver designed for 2 phase stepping motor, it implement PWM to regulate output current. The driver stage is consists by dual MOSFET H-bridge. Fabricated by advanced BCD process to improve performance and reduce power losses. The driver support up to 40V supply voltage and maximum driving current up to 1.8A. The on-chip voltage regulator allows only powered from a single power supply, VM, it highly reduce external components and saving the PCB size. Thermal shutdown (TSD), over-current shutdown (ISD), power-on reset (POR) and under voltage lock out (UVLO) helps to secure operates status.